I use Google reader to read programming posts. 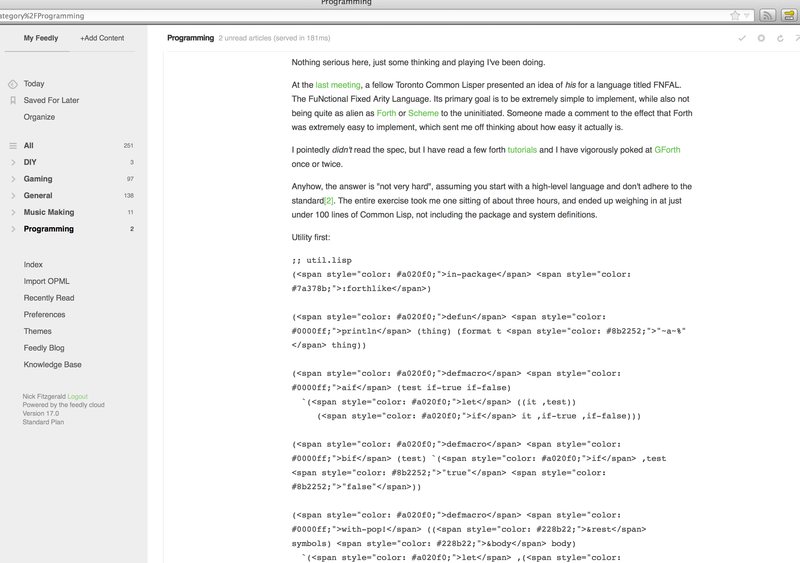 These posts contain lots of source code, that is typically syntax-highlighted using colors etc. via HTML span tags within <pre> blocks. These appear correctly on Google Reader but not on Feedly. In Feedly, the entire <span> tag is displayed as-is, rather than rendered. Suspected reason: feedly automatically converts <span> into "&lt ;span&gt ;" rather than keeping the original angled brackets. Is there any plan for this? I mean it would be really simple if you just for the start include highlight.js. Several of my feeds use text color to convey information. http://the.taoofmac.com/rss is also a feed that regularly uses code snippets and it looks really broken now. Yes, this needs fixed. Google Code downloads are similarly broken. Yes, this is absolutely the most frustrating issue I had since migrating from Google Reader. As an avid programming blog reader, this essentially turns Feedly into a link index, as I always have to open those blogs in a tab. I understand it's important to sanitize HTML in feeds, but it's not that hard. I hope this gets fixed soon! This makes some feeds impossible to read. I just opened a post in Feedly, and it's loaded with <span> tags. Can you please render this HTML instead of showing me all the tags?